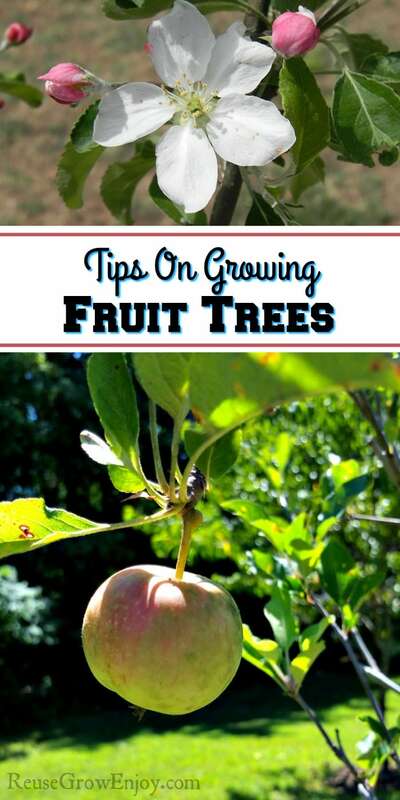 Growing fruit trees in the garden or yard means you will have an abundant supply of fresh fruit. Plus you will have fruit that has not been sprayed with anything toxic. That is unless you choose to spray them. The flavor of home-grown fruit is so much better than commercially grown crops that anyone who tastes it will be amazed. Fruit can be eaten fresh, made into conserves, preserved for later use, or cooked into delicious desserts. Nearly all fruit trees prefer a sunny area. While they can take some shade, they need to have most of the day in the sun. Try for an area that has 7+ hours of sunlight per day. You may want to think twice before planting them in or near your garden. There is no doubt that a fruit tree would do extremely well if planted in with the vegetables in a sunny area, but the vegetables will certainly suffer. This is because of a few reasons. First, the fruit trees need quite a lot of water when fruiting, so the vegetables will likely be starved of nutrients and not crop well. Another problem could be root disturbance. If fruit trees are planted near root crops their roots will be disturbed when at harvest. The garden may also need to be thoroughly dug up at certain times, or sprayed with something that does not suit the fruit tree. However, if the garden is not a raised bed, it is possible to grow a small fruit tree in one corner where it can be left undisturbed. 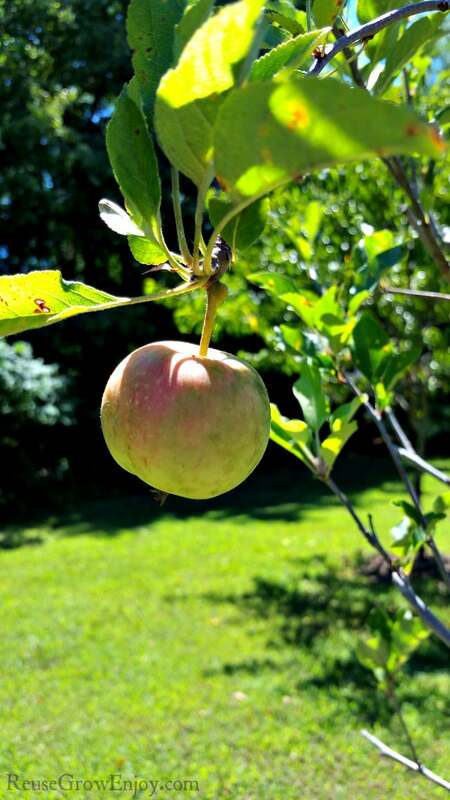 Fruit trees have glorious blossoms, pretty foliage, and the ripening fruit is attractive too. Many fruit trees even have decorative foliage in the fall, so if planted in the middle of the lawn will be as attractive as any other feature tree. It will also provide shade for a seat and for the children and pets to play in. However, the grass should be kept back from the roots while it is becoming established. Fruit trees don’t like to compete with grass for their nutrients especially while they are small. Some small Dorf type of fruit trees like apple varieties such as ‘Ballerina’ can be grown in pots on the patio. Other smaller fruiting trees like lemon can also be grown in large pots in a sheltered, sunny place. These can be brought in in the winter. It is best to follow the directions on the tree you bought. As to how to plant as some varieties vary slightly. However, for the most part, you can following these steps. You want to dig a hole that is as deep as the pot the tree is in. You also want to make the hole double the width of the pot all the way around. Just be sure when planting that you do not put the tree any deeper than the soil that it is already started in. Doing so will cause the tree trunk to start to rot before the roots can establish themselves. After you have planted your trees, they do not need as much care as most garden plants. Natures rain should supply them with enough water unless you are having a really dry season. If so, give them a heavy watering once a week to carry them through till the next rain. If you have a good soil, you should not need to feed the trees. However, if you have a soil that is not so great and it looks like your tree is having a hard time, try adding fruit tree spikes to the base of your tree. Just be sure to stick with the most natural and organic ones you can find as you will be eating the fruit and don’t want to add chemicals to your body. When you plant trees they can handle some bugs. In fact, some are even healthy and needed such as bees to pollinate the flowers. But if you have a heavy infestation of insects that are eating your tree, try spraying it with a natural insecticide like Neem Oil. What about growing berries? They are tasty and nutritious and make tasty jams or desserts – if the children don’t get to them first. Many berries grow on vines don’t take up much room on a trellis or fence. Such as grapes. You can get tips on How To Grow Grapes In Your Backyard here. Some berry vines are thorny, so take this into account when planting them. A thorny vine dangling over a pathway can cause unpleasant scratches. Some berry vines may be ramblers rather than climbers so unless there is plenty of space, they will need to be kept pruned and trained along that fence. Some berries grow on small bushes that will settle happily in or by the vegetable garden, or anywhere else they are planted. You can grow strawberries either in pots, in with the other flowers or vegetables, or in a garden dedicated to them. If you are wanting to grow your own strawberries, check out my post on How To Grow Strawberries Amazingly Well. With a little planning, thought and imagination there really is no reason at all why fresh fruit cannot be grown, no matter how small the plot of ground. Here are some other gardening posts you may enjoy.